Did your panditji ‘horoscope-ically’ declare you a Manglik? I am sure most of you did not even know the term Manglik before Aishwarya Rai’s marriage. The tabloids and channels were full of this back then. Aishwarya symbolically married a peepal tree, before tying the knot with Abhishek to nullify the bad luck of being Manglik. I will not comment anything on this but let me tell you the truth underlying the layers of astrology if you too have been declared a Manglik. There has never been any research and scientific proof verifying that unmatched Manglik couples won’t make a happy marriage. Astrology is based on the shastras that has been passed from generation to generation through tradition. 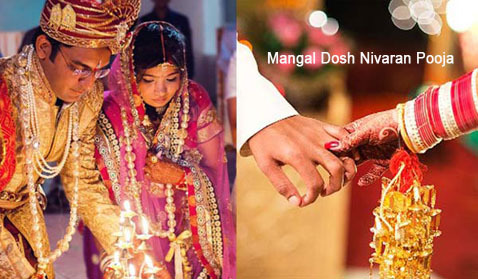 Hindus believe that if you are born under the Manglik star or the Mangal dosha you won’t be happy after marriage. Some Hindu priests also opine that you could have a divorce or your husband might die after marriage. Vedic astrology says that, a person is a Manglik or has active Mangal Dosha in his or her horoscope if the planet Mars is placed in either 1st, 2nd, 4th, 7th, 8th or 12th house of their lunar chart. In Hinduism different houses represent different aspects of life. For example the 4th house stands for contentment and mental peace, 7th for marriage and 8th for long life. Mangal dosha has its root in the planet Mars. This aggressive planet represents self-esteem, temperament, ego, and strife. Therefore, if it is placed in specific areas in birth chart (kundali) chances are that you could be aggressive and violent and later lead to marital discord. It is hence believed that the compatibility between the prospective bride and groom is flawed slightly because of the Manglik effect. Your horoscope determines your fate about being a manglik. Horoscope is usually based on the date, year, time and place of your birth. Most Hindus misinterpret that if born on a Mangalvaar (Tuesday in English), a day ruled by planet Mars, the person is Manglik. Astrologically there are no evidences of this being true as such. This is totally illogical and baseless. There is no science or rational reasoning behind this so-called belief. To get out of Mangal Dosha, you are made to marry a tree first. So that when you marry your groom, it will be counted as your second marriage and the problems related to your first marriage will be removed. This is another belief that is completely baseless. No one will die post marriage because you are ‘allegedly’ Manglik. Do not worry. Oh! C’mon! The success of your marriage depends on you and your partner’s compatibility and understanding. It has nothing to do with you being Manglik. Let me put up this question now, if being ‘Manglik’ is true then why restricted to the Hindus only? Are Hindus some alien from other planet? Astrology is something that is based upon the relationship between astronomical phenomena and events in the human world. Therefore, if it stands true for one religion, it should be prevalent in all other religions. Why restricted to the Hindus only? What is the logical explanation behind it? The word Manglik appears more connected to a religion than astrology. Remember that marriage is about love and understanding of two individuals. It fails if the string attached is cut off and not matching rituals or astrological precautions can help you make or safe your marriage in that case.